t has been a massive journey to capture and define the legacy and influence of concrete poetry on current visual poetry” says Victoria Bean & Chris McCabe. The duo have just co-edited an anthology about the rise of concrete poetry in the digital age in a book that has been released by Hayward Publishing. Featuring artists like Jenny Holzer, Cerith Wyn Evans, John Giorno, Fiona Banner, and Sam Winston with new work from original concrete artists such as Augusto de Campos, Eugen Gomringer, Decio Pignatari, Ian Hamilton Finlay, Henri Chopin, and Bob Cobbing the The New Concrete: Visual Poetry in the 21st Century is a testament on where this art made of letters has been and where it goes. Typeroom wanted to know what visual poetry is all about. Sam Winston's world has already captured our attention but we wanted to know more. Is it bold graphics? Words with meaning? Something entirely different? Here, exclusively for us, Victoria & Chris share 20 things anyone should know about this typographic realm. 1. The origins of concrete poetry started in 1953 in Brazil, Germany and Sweden with the formation of the Noigandres group (siblings Augusto and Haraldo de Campos and Decio Pignatari), the publication of Eugen Gomringer’s poems ‘Konstellations’ and Öyvind Fahlström’s manifesto for concrete poetry. 2. It wasn’t until 1955 when Decio Pignatari was invited to Europe, and met Max Bill’s secretary, Eugen Gomringer, that they realised they were both referring to their work as ‘concrete poetry’. This was seen as the starting point of the international movement. 3. A universal language: the Noigandres group set out to “change literature by creating a universal picture language, a poetry that can be read by all – regardless of what language they spoke. Letters would double as carriers of semantic content and as powerful visual elements in their own right” a quote from Kenneth Goldsmith from The New Concrete. 4. The geographic trajectory of the original movement became a global one through the publication of journals and magazines, and artists and writers travelling between South America and Europe, America and the UK. Anthologies and exhibitions also played an important part in spreading this new work. 5. There were two major concrete poetry anthologies in the 1960’s Mary Ellen Solt’s Concrete Poetry: a World View and Emmet Williams’ An Anthology of Concrete Poetry* which was first published by Hansjörg Mayer and the Something Else Press in 1967. We feature many artists from Williams’ seminal book: Eugen Gomringer, Franz Mon, Pierre and Ilse Garnier, Augusto de Campos, Decio Pignatari, Aram Saroyan, Bob Cobbing, John Furnival, Henri Chopin, Hansjörg Mayer, Ian Hamilton Finlay and Edwin Morgan. *This anthology was recently reprinted by Primary Information. 6. One of our contributors, Hansjörg Mayer, typographer, printer and publisher, was a central figure in the original concrete poetry movement and is known for his ‘Typoems’, ‘Typoactions’, ‘Alphabets’ some first appeared in 1961 in a series called the ‘First Alphabet’. He began the ‘Last Alphabet’ in 1968 but was too busy publishing and lecturing at the time to complete it, but has recently resumed work on it. 8. Ian Hamilton Finlay is still a huge influence today. Brazilian artist Antonio Claudio Carvalho was moved to make his piece ‘THE DAY IAN HAMILTON FINLAY DIED’ on the day the artist passed away. Aram Saroyan’s piece ‘ian hamilton finlay’ features the poet’s name with double dots above each ‘i’. Tony Lopez and photographer John S Webb have made a collaborative poem that is, in part, a homage to Ian Hamilton Finlay’s poetry and Wild Hawthorn Press. 9. Other dedications to the original poets can be seen in W Mark Sutherland’s poem ‘Dairy Products, Aviation, and Insects (for E. Gomringer)’ which references an original work by Gomringer while Eugen Gomringer titles his poem ‘Ilse Garnier’ as a dedication to the concrete poet and wife of Pierre Garnier. Phillip Gallo’s ‘untitled’ features Dieter Roth’s name in the text and Steve McCaffery’s ‘portrait of EP (in memoriam Francesco Conz)’ is a neat expression of Ezra Pound’s name and influence over the early movement. 10. Dom Sylvester Houedard, also known as dsh, was a Benedictine priest at the Prinknash Abbey in Gloucestershire and an original concrete poet in the UK. His amazing typewriter ‘typestracts’ still inspire a range of artists today including Sam Winston whose piece ‘Backwords’ is featured in The New Concrete. 11. Concrete poetry has always been a good place for political expression. Henri Chopin uses his typewriter and coffee cup stains to tell us how he feels about Mr Bush, while the three Turkish poets featured in the book are open about their need for visual poetry to express their political ideals and thoughts: Serkan Işin writes on his website Zinhar that “poetry is a mechanism that allows us to produce anti-codes to help us intervene against the codes that are imposed on us by the city/life.” Jörg Piringer’s work fallen, takes the English translation of The Communist Manifesto and lets the text fall into a pile at the bottom of the page making it unreadable, stripped of its original meaning. 12. The original concrete art movement in the ‘40s was inspired by the way painters and sculptors embraced the materiality of their work with a strong emphasis on abstraction. Today, even with the shortcuts of the digital environment, contributors to The New Concrete still found the need to express their work through materials:Letraset for Derek Beaulieu, purple magic marker for Christopher Knowles, watercolour for John Giorno, and cigarette papers for Tom Phillip’s featured page from A Humument. Paula Claire’s piece poetry in emotion was created not by Photoshop or Illustrator, but by using layers of type photocopied onto acetate and moved slightly to create a circular movement. 13. futura then futura now; Hansjörg Mayers’ publishing projects in the early ‘60s included prints, portfolios, books and the broadside series futura which featured his own work and that of many major practitioners of concrete poetry at the time - all set in the Futura typeface. Antonio Claudio Carvalho has recreated this series of broadsides under the name p.o.w – prisoners opposed to war, featuring The New Concrete contributors Roel Goussey, Chris McCabe, Sophie Herxheimer, Nick-e Melvile, Sam Winston, Simon Barraclough, Tom Jenkins, SJ Fowler, Hansjorg Mayer, Victoria Bean, Augusto de Campos, Peter Finch and Julie Johnstone. 14. A new type. Tom Comitta’s ‘Balding Type’ typeface is composed entirely from online image search results. If you look closely you'll see Dali's moustaches, Demi Moore's mowhawk, Denzel Washington's goatee and many anonymous people. The most visible body is Alicia Silverstone’s in the letter Z. The Henningham Family Press' project, ‘An Unknown Soldier’, includes an invented typeface too, ‘Trench’, whose name reflects the subject of the work which is the First World War. 15. Ian Hamilton Finlay created the one word poem in the ‘60s but contemporary artists have taken this further: some making visual poems without any words: Eric Zboya’s work involves a process called Algorithmic Translation – a process that, through a series of mathematical calculations, transforms the text from Howl into an inky explosion capturing the original energy of the piece. Some have used computer viruses to take pre-existing pieces of text and transformed them into beautiful or arresting images. The language element can be seen as what’s in the background, the code, virus or algorithm that makes the surface image possible. 16. Visual poems exist across many different mediums. At the launch of The New Concrete at the Whitechapel Gallery we saw visual poetry presented as performance, song, animation and film. Andre Vallias’ version of Dante’s Divine Comedy has been translated into QR codes, while Simon Barraclough’s poem ‘Tromsø’ is part of his Sunspots project which includes a book, songs and film. 17. The internet, computer and data are proving to be a massive influence on visual poetry. After several Google translations, the line length of the lyrics of Starship’s song ‘We built this city on rock and roll’, were turned on their side to became a natural cityscape for Cecilie Bjørgås Jordheim’s piece. 18. Is concrete a strand of visual poetry or was visual poetry born out of concrete? 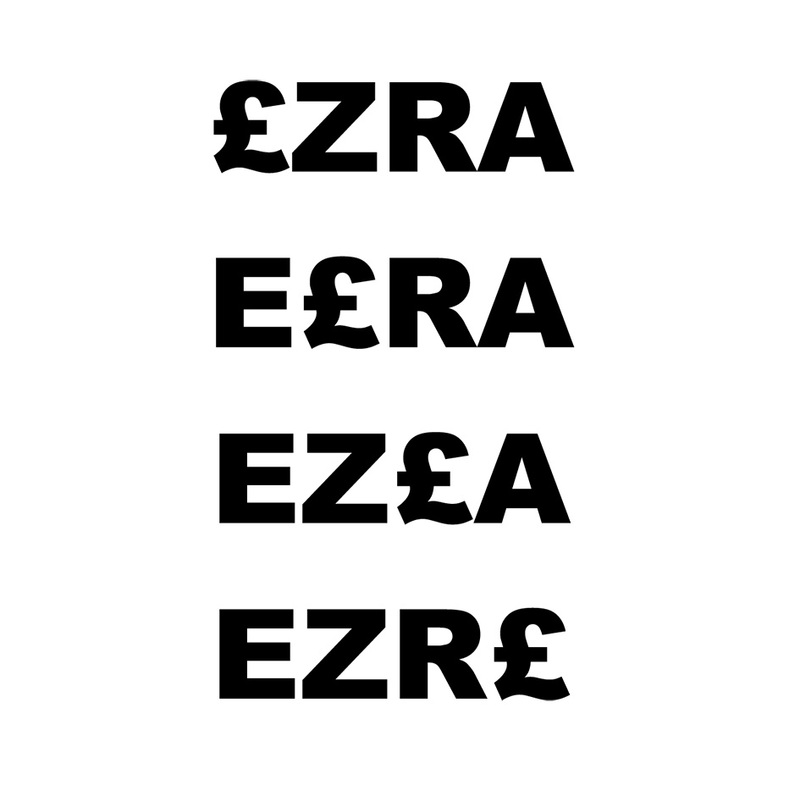 The current visual poetry that we were interested in collecting in The New Concrete is that which shows its direct influence from concrete poetry. Although visual poetry is an ancient form beginning with the later Greek civilisations, concrete poetry as a specific historic movement between the 1950s and 1970s has created such a rich legacy that current poets and artists are still responding to its ripples. 19. Concrete poetry is often very funny. Tom Jenks, a poet from Manchester, cites his influences as Dennis the Menace and Desperate Dan‎, Peter Finch distorts the Welsh Assembly into ‘arsembly’ and Jesse Patrick Fergusson has created a piece in which he picks his own head from a tree made from text.